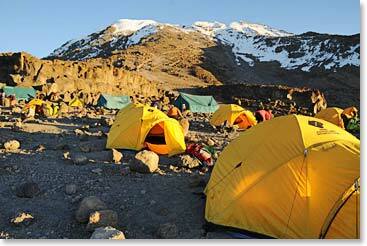 We still have room on our February 2011 trip to the roof top of Africa—Kilimanjaro– via the Lemosho Traverse. This route is the ultimate way to experience Kilimanjaro as it slowly traverses across the mountain’s diverse ecosystems and takes you to its rarely visited places. You will hike through an old growth forest, along a remote plateau, below the northern ice fields, inside the crater and finally, up to the summit. This unique route includes an awesome night camping in the crater at 18,700ft/5700m. For more information on this and other Kilimanjaro trips click here. To make your trip an even greater adventure, add a safari to your itinerary. We have 3 day, 6 day and custom safari options available. Click here for details. Please refer to the Kilimanjaro Dates & Prices page for more information. This entry was posted on Monday, December 27th, 2010 at 10:53 pm	and is filed under Expedition News, Kilimanjaro.